Hobie makes a wide range of watercraft products spanning from sailboats all the way to fishing kayaks. Hobie—named after a man known to the world by just a single name—got started in a basement like so many other wonderful companies. Hobie’s love of watercraft began with the hand-carving of surfboards and established one of the first surf shops in SoCal around 1950. Hobie went on to sponsor some of the surfing greats around the world eventually drifting into the world of boating. Through this blossomed a love of lightweight and fast vessels that were meant to be as much fun as they were deadly in competition. Today, they make some of the best fishing kayaks in the world! From there, Hobie continued to develop as a company, expanding itself into the beacon of quality and omitted feature design know by consumers today. They offer an extensive line of high and mid-range quality watercraft including paddle boards, sailboats, and kayaks with design features seen hardly anywhere else. Lovers of Hobie products are renowned for using them in waters all around the world, including the Amazon, the ocean, and even white water rapids! Hobie has been a pioneer in developing a type of novel foot-peddling technology in their kayaks that offer a motor-less means of extra propulsion. This foot-powered thrust is great for high wind situations, or just when you need to give your arms a rest for a minute. Their MirageDrive 180 foot-powered motor technology, featured on the Mirage line of kayaks, allows for forward and reverse peddling—and even folding in profile with the hull to allow shallow water use! One of the most popular models of Hobie kayaks is the Hobie Mirage Pro Angler, a fishing kayak, that is loaded to the gills with practical features useful to all fishermen. While Hobie is characterized by the almost violently-yellow color, the angler edition fishing kayaks are also available in very camouflaged natural coloring. The Mirage Pro Angler has great reviews on Amazon, and is renowned for its ability to endure the elements, accommodate additional parts such as a sail, and has a 600-pound capacity! The only downside, as reported by some, is that it can be a bit difficult to manage—clocking in at around 130 pounds when fully equipped. To get a better idea of some of the amazing aspects of Hobie kayaks, it’s best to take a look at some of the individual features offered by their products. Listing all the features seen across all of Hobie’s products could take a really long time, so we’ll be focusing on a particular product—the Mirage Outback Angler Fishing Kayak—which demonstrates some of the more unique features offered by Hobie. Hobie is also known for their ground-breaking innovation in re-imaging watercraft in ways that none thought possible. Take for example the Hobie Mirage Eclipse which is a stand-up paddleboard—usually associated with leisurely drifting around—which has a stability bar and foot-peddled power! This type of radical re-imagination of the stand-up paddleboard has earned Hobie the regard of being one of the best kayak brands in the world. The Hobie Eclipse has been bought by many looking for an alternative to stagnant exercise routines such as elliptical and cycling machines. Getting out of the gym and into the world is one of Hobie’s missions, and they are clearly dedicated to delivering consistent, reliable, and imaginative results. In addition to the innovative style of the Eclipse, Hobie also offers a solid baseline of watercraft products which are designed to meet the needs of everyone. For example, their Mirage Outback kayak has been one of their best-sellers for years—being released each year as a redesign—and receives rave reviews. Hobie products simply focus on quality and performance as a required facet of their designs and build upon that platform of stable reliability their innovated new approaches to what is possible. 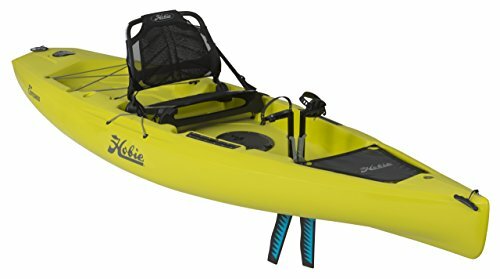 Hobie kayak products are available from select local dealers, or online through Amazon. Hobie Kayaks are among the most well-respected designs in the world, featuring a wide range of different watercraft. Hobie makes use of truly unique design features such as the MirageDrive180 foot-powered propeller system as well as their Twist & Stow Rudder systems. Hobie also offers fishing kayaks catering to the unique demands of anglers everywhere! All around, you'll be hard-pressed to find a better kayak than one made by Hobie.